Palestinians in the West Bank have begun boycotting Israeli goods. They recently dumped a truckload of milk and yogurt in Ramallah’s main square. They are shunning the products after Israel stopped giving the Palestinian government vital tax revenues. The announcement was made by a leader of the boycott, who said the activists involved will visit shops and stores in order to remove Israeli goods from six companies. They added this process wouldn’t involve products being taken by force, while around 80 percent of shops had stopped stocking Israeli commodities. "We entered the second phase of the campaign which is confiscating and damaging these goods," said Abdullah Kmail, who is the leader of the campaign. He added that the stunt, with Israeli dairy products dumped on Ramallah’s main square, was meant to show Palestinians that "the campaign is serious," AP reports. The reason behind the boycott, which was implemented by members of the Fatah movement, was a decision by Israel to stop the transfer of vital tax revenues to Palestinian President Mahmoud Abbas’s government in January. “This is a dangerous issue. Israel is withholding our money and this means that the State of Palestine will face a crisis," Abbas said on February 13, calling on the international community to exert pressure on Israel to release the funds. The move by Israel has seen Abbas’s cash strapped Palestinian Authority only able to pay partial salaries to around 150,000 civil servants and security forces members. Kamil added that Palestine will only lift the boycott once the payment of tax revenues is resumed. The EU's foreign policy chief called Israel’s move to freeze the transfer of Palestinian tax revenues a violation of the Oslo Accords. Israel took the step to halt the transfer of the funds, which it collects on behalf of the Palestinian Authority after the Palestinians joined the International Criminal Court and decided to file war crimes charges against Israel. Palestinian politicians have tried to get the public to boycott Israeli goods on previous occasions, but these moves met with little success. However, due to the current political climate and significant anger towards Israel following the Gaza military incursions last summer, which left around 2,200 Palestinian’s dead, there is a wave of anti-Israeli sentiment amongst the vast majority of Palestinians. 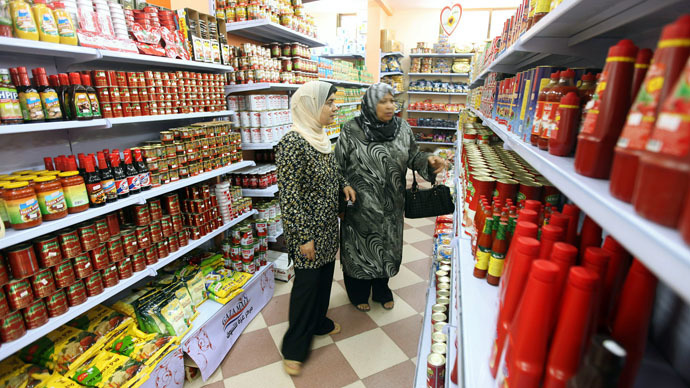 The fallout has seen less and less Palestinian shop willing to stock Israeli goods. It’s estimated the Palestinian market is worth around $700 million to Israeli companies. The current campaign has targeted six firms – Tnuya, Strauss, Elite, Osem, Prigat and Jafora, according to AP. However, Israel has shrugged its shoulders at the decision by the Palestinians, with one food executive saying the goods sold to Palestine are often of the lowest quality and sold at low prices. The biggest loser in the boycott is likely to be Tnuva, which is Israel’s biggest food company. It makes around $52 million to $65 million a year from sales to Palestine, but this only equates to around 3 percent of the company’s total sales. Palestinians aren’t the only ones boycotting Israeli goods. Seven hundred prominent artists have said they will have nothing to do with Israel.This will include turning down professional invitations or funding from institutions linked to the Israeli government "until it complies with international law and universal principles of human rights." "I often feel in despair when I think of the suffering of the Palestinian people living and dying under an apartheid state that disregards international law and universal principles of human rights," said Alexei Sayle, an English stand-up comedian, author and actor.